In this paper, we address the problem of object discovery in time-varying, large-scale image collections. A core part of our approach is a novel Limited Horizon Minimum Spanning Tree (LH-MST) structure that closely approximates the Minimum Spanning Tree at a small fraction of the latter’s computational cost. Our proposed tree structure can be created in a local neighborhood of the matching graph during image retrieval and can be efficiently updated whenever the image database is extended. 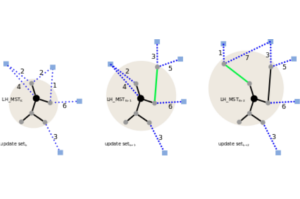 We show how the LH-MST can be used within both single-link hierarchical agglomerative clustering and the Iconoid Shift framework for object discovery in image collections, resulting in significant efficiency gains and making both approaches capable of incremental clustering with online updates. We evaluate our approach on a dataset of 500k images from the city of Paris and compare its results to the batch version of both clustering algorithms.